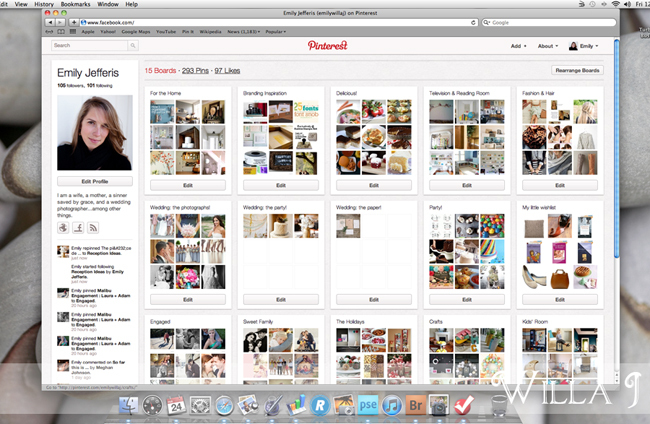 Willa J Photography: Things I love: Pinterest! Hello and welcome! I'm Emily Jefferis, a wedding and lifestyle portrait photographer located in Grove City, PA. Investment information, details, and my portfolios are available at www.willajphotography.com. If you have any questions, please don't hesitate to contact me through emily@willajphotography.com. Thanks for looking! I am beginning a new little blog series today called Things I love. I know, painfully original:). But as much as I love creating Grateful posts, I sometimes refrain from writing them for fear that my gratitude will appear disingenuous or trite. After all, it feels a little silly to declare that I'm grateful for a new pillow. Sure, I could conjure up some little anecdote about the pillow that will lead into my gratitude about rest or sleep. But I'm a full-time mom doing photography part-time and my time for blogging is limited. SO, cue these new Things I love posts. No great depth or long explanations here...just simple things I love. Today, I'm kicking it off with Pinterest. Once you get past the initial honeymoon stage, Pinterest becomes a fantastic source of inspiration and a terrific tool for storing great ideas and images you find on the web. My husband's also a fan because of my little wishlist board--it's now his go-to resource for gifts. So if you haven't yet jumped on the Pinterest wagon, I highly recommend trying it out. Especially you brides--it's full of great wedding ideas. Enjoy your weekend, everyone! All images copyright Willa J Photography, LLC 2009-2014. Simple theme. Powered by Blogger.